Happy Thanksgiving! I am back in Edmonton after a nice vacation to the Okanagan with Sharon. I’ll write something about that once I upload all of our photos. And once I warm up, as it was a bit of a shock to come back home and immediately have non-stop snow and below-zero temperatures! In case you missed it: the City of Edmonton launched a redesigned website a couple of weeks ago. It’s responsive and features more self-service capabilities. I’m thrilled that all of my existing knowledge of the structure of the website still applies. Well done folks! Employment in the Edmonton region decreased by 8,500 jobs in August 2016, according to the latest Economic News newsletter from the City. The slumping economy is having an impact on charities, many of which are facing increased demand even as donations drop. Edmonton’s office vacancy rate rose slightly from July to September and that could be the start of a long-term increase according to a new report by real estate service firm Newmark Knight Frank Devencore. The Oilers made it official this week: Connor McDavid is the team’s newest captain. They also signed Kris Russell to a one-year contract. I think the recent upswing in positive tourism-related coverage of Edmonton has more to do with Travel Alberta and Edmonton Tourism finally doing something to cultivate attention rather than any major changes in our city, but I welcome it just the same. The City has provided $4 million in Cornerstones grant funding to Habitat for Humanity to build new homes for 75 families in the Edmonton area. For the second year in a row, the City of Edmonton has been named Canada’s most open city among 68 municipalities. Mayor Don Iveson has won the 2016 Urban Libraries Council Urban Leader Award for championing, promoting, and elevating Edmonton’s public library system. Congratulations to Phyllis Clark, Tim Fell, and Chris LaBossiere, who were appointed to the TEC Edmonton Board of Directors on September 29. “Pillars of the Community” is a piece of public art outside Rogers Place that features portraits of those who work at and use Boyle Street Community Services. The City is looking to develop programs to help reduce household food waste and they want your imput via an online survey that is open until October 11. The snow is here now, but if you’d like to enjoy the fall colors a little longer be sure to check out The Edmonton River Valley Panorama Project. Just beautiful. If you are ready for winter though, you’ll be happy to hear that the Edmonton Freezeway is expected to return with a possible expansion. 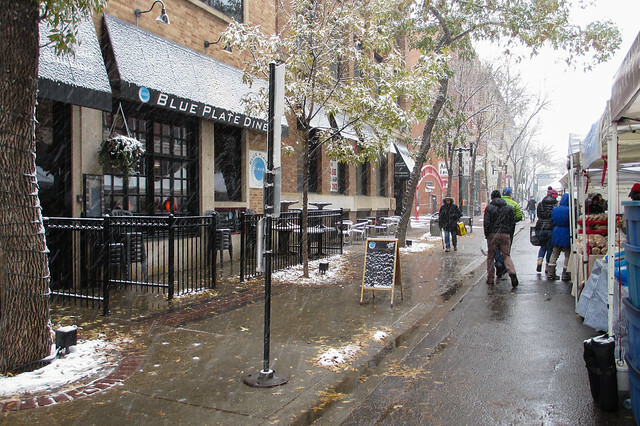 Also, get prepared with 11 reasons to look forward to winter in Edmonton from I Heart Edmonton. This week is Fire Prevention Week. Check the expiry date on your smoke alarms! Sir Salman Rushdie is speaking at the Chateau Lacombe on Tuesday. The Edmonton Oilers kick off their regular season on Wednesday evening at Rogers Place as they host the Calgary Flames. They finished the pre-season with a 5-3-0 record. Learn about Marketing for Creatives on Wednesday at the Made Local Society. LitFest starts on Thursday and runs for 11 days featuring more than 50 presenters. You can see the full schedule here. Thursday evening is the final 124 Street Grand Market of the year! This year’s Hoofbeats & Heartbeats Gala takes place on Friday at Fort Edmonton Park. The inaugural Alberta Open Data Summit takes place on Friday and Saturday at the Stanley Milner Library downtown. The City Market moves indoors to City Hall until the spring starting on Saturday! DECL is hosting an e-waste collection event on Saturday for downtown residents. Good idea! Head over to Transcend Coffee in the Mercer Warehouse on Saturday for the Edmonton Coffee Week-themed Cash Mob! The Edmonton Woman’s Show runs Saturday and Sunday at the Edmonton EXPO Centre. Celebrate World Food Day on Sunday with the Edmonton Food Council at a screening of the new film SEED: The Untold Story. Edmonton Coffee Week runs a little longer than a week this year, from October 14-22. Get ready: Edmonton Startup Week and Small Business Week both run October 17-21!